It's here everyone!! 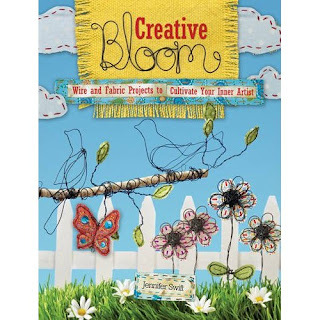 My first book, Creative Bloom: Projects and Inspiration with Fabric and Wire is now AVAILABLE!!!! "I just received this magnificent book. Just to see to box in my mailbox gave me a big smile! Couldn't wait to flip those pages. 40 minutes later, I was still in the stairs with my coat on when my boyfriend came home, looking at the book...I'm seeing forward to try all those nice inspirations." "I pre-ordered this book and couldn't wait for it to arrive. It was certainly worth the wait! I love the projects and the way the author takes us through an artistic journey. It's inspiring and encouraging with beautiful projects to get your creativity flowing. I opened it and read the entire book in one sitting. I just couldn't put it down!" 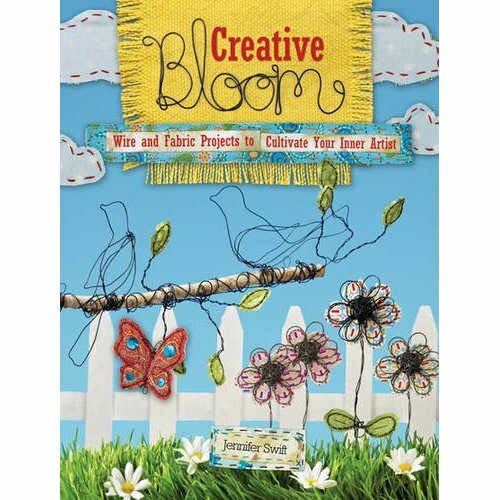 "I am a multi media paper wire fabric artist, and saw this book online while I was looking for something else. They didn't have it at my library, so I just ordered it. It has some really cool ideas that can be used in lots of ways. Very cool, whimsical and fun. Just get it!" "I pre-ordered this book, and although I have taken a class from Jennifer, I was excited and surprised at all the fun projects. I'm mainly a painter but have tried just about every art medium, I think this new art form/craft can be for anyone! Whatever medium you are used to working in... let Jennifer teach you wire & fabric! If you appreciate texture and color - you will love it! I know the book will take my learning of this fun medium to new heights! I worked on wire projects all night last night... and I can't wait to go home and work on more! She gives great pictures and instruction on the "how to" of this fun art form she created. Jennifer's creative spirit shines in this gem of a book - a true inspiration! I love that there are SO many project ideas... this book isn't a quick read... you will be able to work through project after project! Definately worth the buy! Jennifer makes you fall in love with wire and fabric, just beautiful! Love it!" "I too pre-ordered this book. The book is pure eye candy for wire and fabric enthusiasts like myself. Jennifer provides us with NEW and EXCITING ways to pair not only wire and fabric, but other mediums as well. After the first few pages my mind was already alive with ideas and inspiration! That's what I look for in a well written book. This book is genuine, comes from the heart and is a welcomed addition to my art library. " "I enjoy trying new crafting techniques and was intrigued by Jennifer Swift's wire art creations. Her book is full of fun and unique projects, with simple to follow instructions. I've completed the first project with great success, having never worked with wire before, and I can't wait to try more! Not only does she share her artistic techniques, but she also shares her own artistic journey and ways to bring more inspiration into our own lives. Between the unique projects and inspiring writing, this book is quite the treasure!" "I love this book! It is one of those "gotta have it" ones. Not only does the author inspire you to do your own thing, she also gives you complete instructions with pictures and patterns to make all the projects in the book. My favorites are the Inspiration Board, the Fall Leaf Garland, the Summer Sun Catcher, the Blooming Flowers, the Charm Bracelet, the Scribble Heart...well, you get the picture. This is one of those books that even if you don't make a single project in it, you are just happy to have it, because it makes you feel good every time you open it and look inside." You can order it here or here or here. If you've got the book I would love to have you leave a review on Amazon about the book. You can do that here. Thanks again! Coming Soon! The Next Adventure Includes YOU!